(left) Johnny Nguyen and Dustin Nguyen, and (right) Veronica Ngo Thanh Van. The Skinny: Vietnamese actioner from Charlie and Johnny Nguyen possesses a thin story and generic themes, but the action and overall package still entertain. Watchable, if not noteworthy. Coming to North America courtesy of Dragon Dynasty. Those marketing geniuses at The Weinstein Company have picked up the Vietnamese actioner The Rebel for their Dragon Dynasty home video label, and the fit is an obvious one. Dragon Dynasty looks for Asian action vehicles, and The Rebel is A) Asian, and B) has action. It's also decently produced, is free from cultural hijinks that would turn off the genre's red-blooded target customer, and it features an attractive, high-kicking female star. It also has a cast member from 21 Jump Street, but that probably didn't factor into Dragon Dynasty's decision at all. Anyway, they got it, and they'll soon be bringing it to North America. Lucky us. Charlie Nguyen directs his brother, stuntman Johnny Nguyen (one of the heavies in Tom Yum Goong, plus Tobey Maguire's stunt double on Spider-Man 2) in this period actioner set in 1920s French Colonial Vietnam. Nguyen is Cuong, a white-suited undercover officer working for the French government, meaning he's not-so-nice to his Vietnamese brothers and sisters. 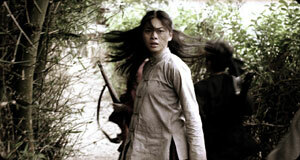 However, his life changes when he encounters the beautiful and deadly Thuy (Veronica Ngo Thanh Van). The two would-be enemies first meet when she mounts an assassination attempt on a French official alongside a bunch of other rebels, and Cuong finds himself in her way. Cuong helps to quell the attack with fellow officer and turncoat countryman Sy (Dustin Nguyen of 21 Jump Street), but something about the bloody suppression of his fellow Vietnamese bothers Cuong. Thuy turns out to be the daughter of a wanted rebel leader, and Cuong finds that he can use Thuy to capture her father, thus earning more points with his French superiors. Or, enthralled by her beauty and righteous determination, Cuong can choose to turn his back on his mercenary profession and fight for his people and all that's right. What will Cuong choose to do? If you can't guess correctly, then you've never seen a commercial film in your life. The Rebel was obviously made to drag in mass audiences, and it does its job in a solid and acceptable fashion. This is crowd-pleasing action flick that plays like a combo between an old cliffhanger serial and a nineties Hong Kong martial arts flick, and nothing here really surprises. Commercial clichés abound; despite being a bad guy for all of twenty minutes, Cuong soon repents, joins the side of the angels, and fights for the people, freedom, and probably universal suffrage in subplot left on the cutting room floor. The screenplay is competently crafted, yet totally generic and more than a little thin. Cuong's motivations are never truly convincing, and one could even think that it's simply his physical attraction to Thuy that changes him from government pawn to rebel hero. All things considered, that may be enough. As Thuy, Veronica Ngo Thanh Van delivers a star-worthy performance, possessing enough presence and action ability to shore up Johnny Nguyen's relative lack of depth. 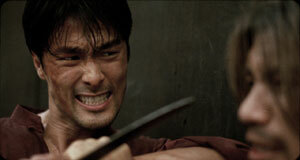 But whatever Nguyen lacks in acting, he makes up in action. Nguyen engages in some hard-hitting and very entertaining fight sequences, during which The Rebel really takes flight. This isn't balletic martial arts dance nor is it a one-sided Donnie Yen MMA beatdown; this is fast action that's very exciting for its power, impact, speed, and punishment towards everyone involved. Dustin Nguyen gets in his licks too, glowering menacingly while taking more damage than is humanly possible. In an odd detail, his character possesses a Shaolin Iron Vest-type invulnerability, which is fun to watch, if not really logical.